If you are already this far, you have probably caught your first glimpse of a Shiba. It may have been at a dog show, walking in a park, or just a picture in a book. Cute, huh? The Shiba is probably one of the most universally appealing of all breeds. It has the look toy manufacturers try to capture in their favorite stuffed animal, the teddy bear. But the Shiba is not a toy. It is a very lively little dog with a unique set of characteristics. Each one is an individual with his own personality, but there are some traits that are considered typical of the breed. Dog ownership is a long term commitment; not something that can be stuffed in the closet once the novelty wears off. A dog's love is for keeps. Originally, Shibas were bred to flush birds and small game and were occasionally used to hunt wild boar. Now they are primarily kept as pets, both in Japan and the United States. There are more Shibas in Japan than any other breed. Around 7000 BC the ancestors of today's Shiba may have accompanied the earliest immigrants to Japan. Archaeological excavations of the shell-mounds left by the Jomonjin, or Rope-Pattern People (a name derived from the pattern found on their earthenware), show that they had small dogs in the 14 1/2 to 19 1/2 inch range. In the third century BC, a new group of immigrants brought their dogs to Japan. These dogs then interbred with the descendants of the Jomonjin dogs, and produced canines known to have pointed, erect ears and curly or sickle tails. In the 7th century AD, the Yamato Court established a dogkeeper's office that helps maintain the Japanese native breeds as an integral part of Japanese culture. Although the country was closed to foreigners from the 17th through 18th centuries, some European dogs and a breed known as the Chinese Chin were imported and crossed with native dogs living in the more populated areas. Dogs in the countryside, however, remained relatively pure. 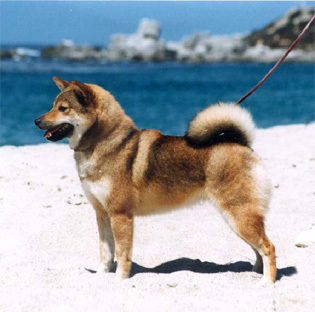 Originally there were three main varieties of Shiba; each named for its region of origin. Although similar, the Shibas from each area contributed to differences in breed type seen today. From the original Japanese native dogs, six distinct "breeds," in three different sizes developed. The Shiba is a very proportionate dog with a height to length ratio of 10 to 11. Males run from 14 1/2 to 16 1/2 inches tall, with females ranging from 13 1/2 to 15 1/2 inches. Heights over or under the limits are a disqualification in the show ring. The weight varies according to height up to about 25 pounds. It is a medium boned, moderately compact and well-muscled dog with a generally Spitz-like appearance. Because of its hunting heritage, it is quick, agile and able to turn on a yen. It has a dense double coat similar to that of a husky. Although all colors are acceptable in the Shiba standard, red, red sesame (sable) and black and tan are preferred. White and cream shadings (urajiro) are present on the legs, belly, chest and part of the face and tail. With a black button nose, little pricked ears and a curly tail, the Shiba enters the world knowing he is a superior being. Whether with intrepid boldness, squinty-eyed cuteness or calm dignity, he is king. The Japanese have three words to describe the Shiba temperament. The first is "kan-i" which is bravery and boldness combined with composure and mental strength. The opposite side of "kan-i" is "ryosei" which means good nature with a gentle disposition. One cannot exist without the other. The charming side of the Shiba is "Soboku" which is artlessness with a refined and open spirit. They combine to make a personality that Shiba owners can only describe as "irresistible." If a Shiba could only utter one word, it would probably be "mine." It is "mine" food, "mine" water, "mine" toys, "mine" sofa, "mine" crate, "mine" car, "mine" owner, and "mine" world. Sharing is a concept he feels others should practice. Some Shibas may carry "mine" a bit too far and become aggressive in their resource guarding, particularly in the presence of other dogs. It is wise to remove favored toys and food-based treats in the presence of other dogs and small children so the dog doesn't become overly possessive. If the bait is dangled when a potential Shiba owner sees adults at a dog show or pictures in a magazine, the hook is set when he encounters his first puppy. They are exemplary examples of canine cuteness, fiery little fuzzballs-from-hell, no words can describe the appeal of the infant Shiba. A litter of Shibas is a Dakin™ Convention and a school of piranha; strutting, posturing little windup toys. The adult Shiba is far from a toy. 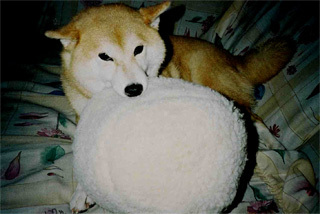 "Macho stud muffin" has been used to describe the male Shiba. The body may look "muffin," but the mind is all "macho stud." The Shiba takes the "spirited boldness part of his temperament quite seriously. Early socialization and neutering are mandatory for the young puppy. Dog aggression, especially in the un-neutered male, is a breed characteristic. This fiery aspect of the Shiba nature cannot be taken lightly.Most Shiba owners learn to deal with the difficult aspects of the dog's temperament to enjoy the delightful ones. With "Soboku" the Shiba sets his hook into the heart. This is "artlessness" with squinty eyes, airplaned ears, and a vibrating tail. It is "charm" standing in your lap, washing your ears, and "dignity" plus "refinement" born of the knowledge of superiority. food. They can run for miles with an athletic companion or take their exercise chasing a tennis ball around the back yard. Their catlike agility and resilience provide good resistance to injury, and the "natural" size and symmetrical proportions lessen susceptibility to conditions caused by structural imbalances. 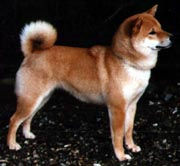 Despite these assets, Shibas can have some hereditary defects, for which all reputable breeders screen their breeding stock. 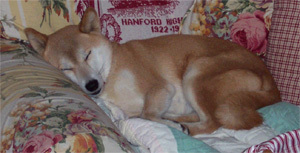 Patellar luxation is common in toy breeds and sometimes appears in Shibas. It causes loose kneecaps and is usually not severe enough to be detrimental to a pet. 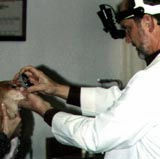 An experienced veterinarian can detect this condition by palpation. Moderate to severe patellar luxation can easily be corrected by surgery and the dog will lead a normal, healthy life. 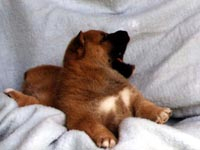 Hip dysplasia occasionally occurs, but it is not as serious in the Shiba as it is in large breeds of dog. Mild dysplasia will not show any adverse clinical effects and the dog will lead a normal life. Good breeders will not breed to any dog whose hips have not received a rating of "fair" or better from the Orthopedic Foundation for Animals (OFA). Allergies, especially to fleas (see flea section of this page) are the frequent nemesis of dogs, and Shibas are prone to them too. With the advent of the newer flea preparations, the problems should be minimized. Other allergies require veterinary help. A rule of thumb: If the itching is from the shoulders back, it is probably fleas. If the itching is somewhere else, it may be something else. Just like with humans, allergies are not life-threatening, but are very common and very annoying. Occasionally, a Shiba puppy may exhibit a heart murmur (an unusual sound to the heartbeat). Usually these go away without treatment, and there is no cause for alarm. If an adult has a heart murmur, it should not be used for breeding. Good breeders will take their puppies to the veterinarian before selling them for a well-puppy check up. Smatterings of other defects have been reported, but none in numbers to cause concern at this time. Reputable breeders do all they can to screen for serious problems and will guarantee their puppies to be free of disabling hereditary problems for the first few years of life. You have probably been admonished to buy from a reputable breeder. Where are they? You may look in the newspaper, but the best breeders use other methods of advertising. Many do not need to advertise at all as they only have a few litters each year and their good reputations precede them. It is best to check with the National Shiba Club of America (NSCA) which is the national organization (parent club) for the Shiba. In fact, if you are reading this article, you are already there. Start with this Club's Breeder Directory and try to avoid websites that offer selling services to anyone who wishes to place an ad. It's rather like choosing a dentist from an ad on the side of a bus. 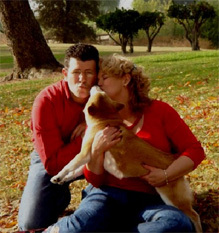 Let your best instincts guide you when choosing a breeder. Don't pick a puppy because you feel sorry for it or want to "rescue" it. This is an animal that will be sharing your life and the life of your family the next 12 years or so. Take your time. If it doesn't feel right, it probably isn't. Visit several breeders and pick one with whom you feel comfortable. Choose one who is willing to help you both before and after the sale. Since Shibas often aren't readily available, choose the breeder first and place a deposit on an upcoming litter. If possible, see the puppies as they develop. A breeder should not mind the visitation as he wishes to become acquainted with you too. Sometimes adults are available from breeders or people who have kept them as potential show dogs. For some reason, frequently size or dentition, the dog did not turn out to be a show dog. These dogs usually make outstanding pets as they have been carefully raised and are past the "puppy stage." Some mature show dogs are no longer being bred and are the perfect age to take up residence on your sofa, under your desk or as a traveling companion. Adult dogs readily adjust to a new family and almost instantly adapt to being a spoiled only child. There are no surprises with an adult. What you see is what you get. Sometimes, whether through impulse or frustration in trying to find a good breeder, people end up considering a pet store puppy. Puppies found in a pet store have been bred strictly for profit. Quality is seldom a criteria. People who breed these puppies do not know where they go and have no contact with the animal after it is sold to the pet store. It is not to say that a nice puppy cannot be obtained through a pet store, but common sense dictates that it is better to work with someone who has the welfare of his puppies as his highest priority, not money. 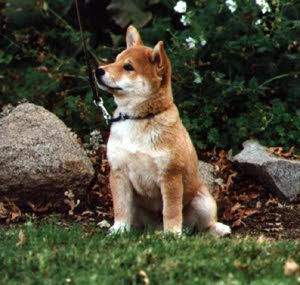 Shiba fanciers dedicated to the breed and AKC recognition founded The National Shiba Club of America in 1983. In 1992, the NSCA was granted Parent Club status by the AKC. The Club is active in all aspects of the Shiba world. It hosts a National Specialty every year as well as an Agility, Obedience and Rally Trial. It has judging seminars, public education, and committees dedicated to the health and well being of the breed. It also publishes a bi-monthly magazine of interest to all Shiba fanciers, called the Shiba-E-News. Each month's cover is featured on the home page of this website. Read the other information available on this website, including the Judge's Seminar, featuring some beautiful Shibas from both Japan and the US. Carefully check out the information on the Breeder Directory and visit the links mentioned there. Also, visit the websites of the breeders listed in the Directory. There is much useful information in them as well as beautiful dogs to see.